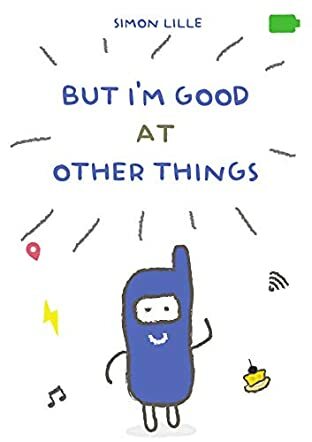 But I’m Good at Other Things by author Simon Lille is a charming children’s book about a cellphone named Noky. The dialogue feels pretty realistic of most children, and the way that things get misinterpreted also rings very true of how children interact with one another. The overall feel of the book to me had a positive message behind it, and books with a truly higher purpose such as this are important works. Simon Lille’s But I’m Good at Other Things made me smile a lot and chuckle to myself as well. I feel anyone with a sense of humor will warm to this book quite quickly and easily. I’d like to think that I’m pretty much a big kid at heart, so I am of the opinion that children will love this book and that adults who are also young at heart will enjoy it as much as I did. A book about different makes of cellphones and comparing them to how children may treat other children really adds a deeper layer to this book. I feel that children and adults can see behavior as a whole in front of them and perhaps be more aware of how they treat others around them. The illustrations were colorful and simple. I think kids will like the look of them as well and connect to them more. If you have a child who enjoys drawing, this would especially be a great book for them to look at the pictures. An excellent book to have on your shelf at home.